At the end of October northern Europe starts getting chilly, but Istanbul stays warm well into November. We were lucky to have up to 23 degrees centigrade and blue skies every day. Getting to Istanbul from Berlin is cheap and fast: we paid 220 Euro per person with Germania, direct from Berlin TLX; the flight time was a little over two hours. We had a really wonderful hotel, which I found in the Lonely Planet guidebook: the Askin Hotel. They accept reservations by phone and email, and have a friendly and helpful staff speaking English and German. We had a view from our rooms directly on the Bosphorus, and later on the Blue Mosque, one of the primary sights of Istanbul. From the rooftop terrace we had a gorgeous panorama of the Blue Mosque, the Marmara Sea, and the Bosphorus. We would have a hard time finding any better or more conveniently located hotel, and all that for a double room price of 65 Euros per day including breakfast. Highly recommended. 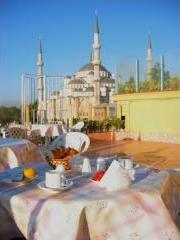 Both the image to the right and the Blue Mosque image at the top of this page were taken on the hotel terrace. Getting from the airport to the hotel was easy - find a cab, make sure you come to an agreement about the price, and 45 minutes later you are there. It only costs a cool 15 million Turkish Liras each way. The Lira is not one of the world's strongest currencies, a million Liras is about 60 cents. I miscounted all those zeros on the bills a few times. Prices tend to be significantly lower than in Germany even in the most touristy places. Standard EC ATM cards work in local ATMs. 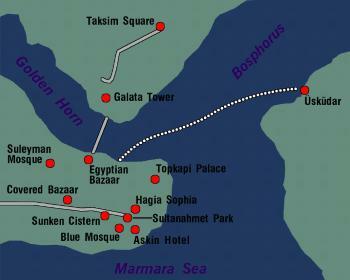 Istanbul consists of three different sections: the southwest, almost a peninsula bounded by the Marmara Sea, the Bosphorus, and the Golden Horn, where most of the monuments are located; the more modern north-west section on the other side of the Golden Horn; and the east on the Asian side of the Bosphorus, which is primarily residential. 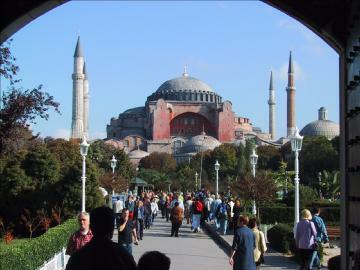 On the other side of the Sultanahmet park, the Hagia Sophia was originally a Christian Church, later converted to a Mosque after the fall of the Ottoman Empire, and finally to a museum. Some of the old Christian mosaics have been restored, and there are exhibitions on the upper gallery. 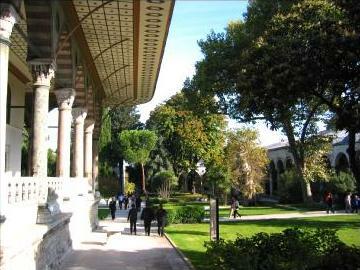 Also on the peninsula, just behind the Hagia Sophia, begins the Topkapi Palace park. It consists of four courtyards: the first for the public, the second for people with palace business, the third for emissaries, and the fourth for the Sultan. Of course, there aren't any Sultans anymore and tourists have taken over. The Harem is a little overrated. Its reputation of one big bordello for the Sultan isn't true, it's really a regular (well, if you are a Sultan) household with very strict rules laid down over the centuries that assign obligations as well as privileges to everyone. The top left picture shows the third court; top right is an ornate door in the fourth court, and the bottom two are from the harem. You are invited to take pictures there. 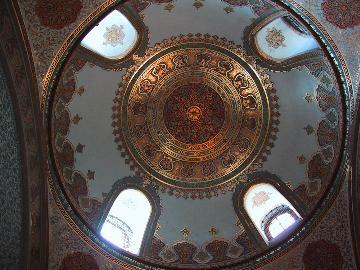 The Harem can only be visited with a tour guide, and there is a separate admission fee, another 15 million. The place is huge, with lots of beautifully decorated rooms. 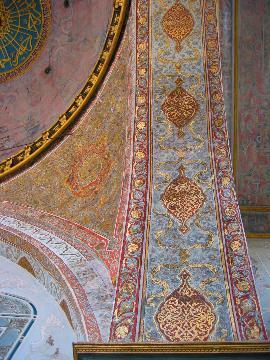 People didn't sit on chairs but reclined on pillows, so special attention was paid to decorate ceilings and domes. 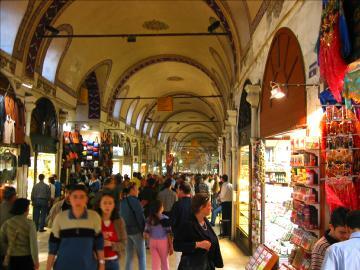 The bazaar is not a pure tourist trap though, it is actually used by the locals to shop, and souvenirs do not dominate. It is so huge that there are places crowded with tourists, and others with few people. There are few touts or pushy vendors, it's actually quite pleasant. 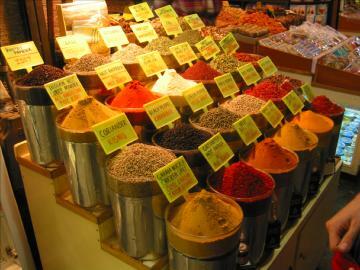 To the north of the covered bazaar, near the south end of the Galata bridge that crosses the Golden Horn, is the Egyptian or Spice Market. It is much smaller, and as the name indicates has a lot of exotic spice, fish, and food vendors like the one shown in the right picture above. 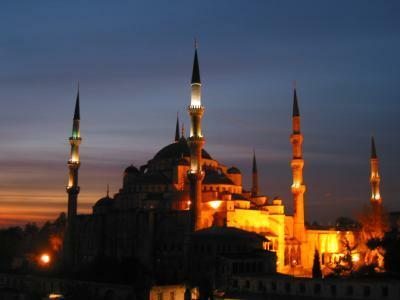 Between the two, there is the massive Suleyman Mosque, rising prominently above the skyline. 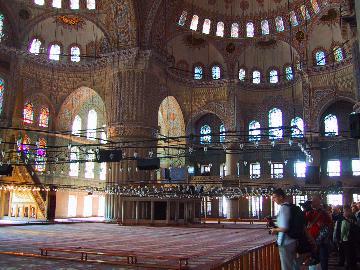 It is not unlike the Blue Mosque, but less lavishly decorated. Closer to the Blue Mosque on Divan Yolu, the Sunken Cistern is a huge underground cavern held up by 336 columns, many of which were taken from older buildings. There are two with Medusa headstones in the back of the cistern. 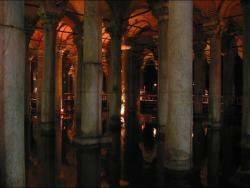 The cistern was the end point of a long aqueduct carrying water into the city. The aqueduct is mostly gone except for a part west of the covered bazaar. The picture to the right shows the cistern; this is a 15-second exposure, it's really quite dark. Farther south-west, away from the major attractions and close to the Marmara Sea, there are residential neigborhoods with countless little shops and restaurants. We walked through one where almost all the shops sold TV sets and electronic equipment, but not in large franchise stores but little family outfits where one can watch a repairman busy repairing opened sets. There are the inevitable cellphone vendors, but in general the equipment was very outdated. This part of town is not quite as polished as the areas near the tourist attractions but clean and quite busy. In general, Istanbul felt much cleaner and modern than the last time I was there fifteen years earlier, when I was touring European cities as a student. Istiklal Cad is a long pedestrianized street on the north side of the Golden Horn, the waterway that splits European Istanbul into two parts. 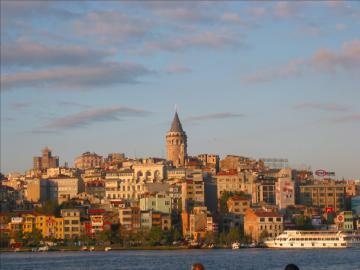 Its southern end is not far from the Galata Bridge and the Galata tower. 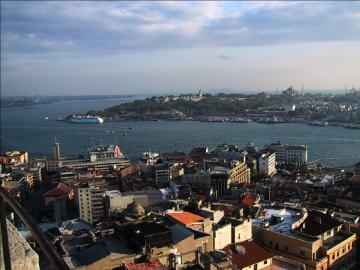 The Galata tower has a gallery with a wonderful panorama of Istanbul. The left picture below shows the Galata Tower seen from the south side of the Golden Horn, near the Egyptian Bazaar; the right picture shows a southeast view of the peninsula, with the Bosphorus to the left, the Golden Horn in the center, and Topkapi Palace and the Blue Mosque barely visible at the center and right horizon. Istiklal Cad leads north towards Taksim Square, a large and quite ugly square where many streets carrying lots of traffic meet. Istiklal Cad itself is pedestrianized, which means few cars, and has a historical trolley running in the middle. This street was the attempt of the last Sultan to rapidly modernize the country; there is a lot of Western architecture here. Today the street is lined with the usual Western upscale chain stores, fast-food restaurants, the occasional embassy, and lots of bazaar-like side streets. Always quite dignified though. East of Taskim Square, at the Golden Horn, is Solmabahce Palace, another attempt of the Sultan to emulate Western royal courts. 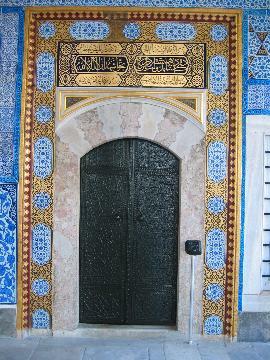 The Sultan left Topkapi Palace and lived here. We did not tour it because it's open only to guided tour, and it can be difficult to get in because space is limited. The Bosphorus, which connects the Marmara Sea (which is in turn connected to the Mediterranean Sea) to the Black Sea. It separates Europe from Asia, with Istanbul straddling it. THere are two ways to cross the Bosphorus: using one of the many ferries, or the bridge. 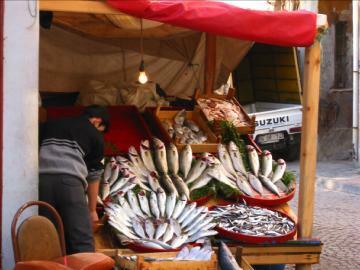 We took a ferry that left between Topkapi Palace and the Galata Bridge, to �sk�dar on the Asian side. The ferry was quite dilapidated but made it across safely. Both pictures were taken below, near the Bosphorus Bridge. The flags strung across the street are political party symbols; there was an election coming up. They choose simple icons and replicate them on countless flags all over town. The guys with the lightbulbs on a yellow field won. There is a mosque right at the �sk�dar ferry harbor, but there are very few sights or tourists here. 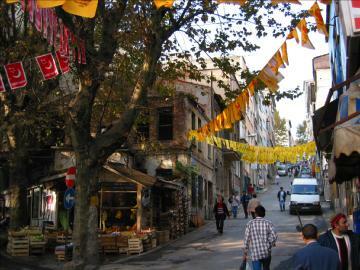 The Asian side of Istanbul is primarily residential. We walked around a little, and then followed the Bosphorus north towards the bridge. There are quiet and affluent neighborhoods here, with nice views of the water. Near the bridge there are many small shops and restaurants. It's not possible to walk across the bridge so we took a cab to Taksim Square; cabs are cheap here. This one even had a meter so we didn't have to haggle. English or German isn't as readily spoken there as on the more touristy European side.